Fry the bacon in a pan until crisp, remove and then brown the mushrooms in the same pan. Add the spring onions, spinach and tomatoes, and fry for a few minutes more until the tomatoes have burst open and the spinach has wilted. Spoon the bacon into the mixture and keep warm. Heat a small non-stick pan over a hot plate. Add a little of the beaten egg to the pan, tilting it to spread the egg evenly just as you would a pancake. Cook for 30 seconds until golden brown and flip over to fry for a few seconds more. Repeat with all the pancakes. 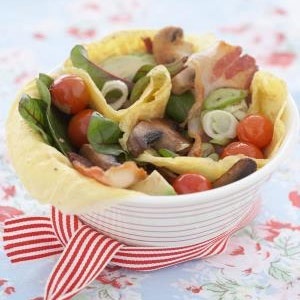 Divide the bacon filling among the pancakes and serve with chopped avocado.